Your book is absolutely brilliant; a real in-depth study which will give me many hours of happy and interested reading. It was clearly a real labor of love on your part! I just finished your book yesterday, Frank. Wow, you really nailed it. It covers all of the bases in a very human, intelligent, and funny way with just the right amount of subjectivity. I also like when music writers are also musicians because it allows the writer to go deeper into the process, and the writer also "gets" the personal experience of creating music, something a non-musician writer can only approximate. The problem is that a lot of musicians who write end up going "the Guitar World route" and soon it devolves into music-theory academic-sterility. You really found the perfect balance in this book. “Modern Listener Guide: Jimi Hendrix” is a really entertaining book and I learned a lot along the way. It also looks amazing. The Perfect Rock Book - well done! This is a wonderful book. It's an absolute treasure trove of information about one of the most influential musicians of all time. I would highly recommend that everyone, who has even the least bit of interest in the life and times of Jimi Hendrix, should own a copy. Your inputs from a musician's perspective are educational. A couple of times I have listened to a track twice in an attempt to hear exactly what you are describing. One thing I am certain of: when I eventually reach the end of this wondrous book, I will just go back to the beginning and start over, listening all the way. A pleasurable read, and great accuracy. This book is awesome - very entertaining from the first word to the last. 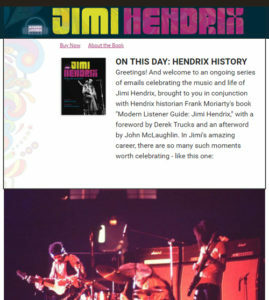 Frank Moriarty's new book on Jimi Hendrix "Modern Listener Guide: Jimi Hendrix" is a fascinating read and definitely one of the very best Jimi Hendrix books - in fact, it's indispensable. Frank avoids all the rumors and gossip that surrounded Jimi and sticks to critiquing the music chronologically. His thoughts and observations on Jimi's music are intelligent and obviously are indicative of his great love for Jimi's incredible music. I found myself saying "YES!!" out loud when Frank would discuss some of Jimi's music that previously received little commentary or was even dismissed. This is indeed the Hendrix book you need. Your book about Jimi Hendrix captures the essence of this exceptional artist. Jimi Hendrix was the most creative musician I've ever seen, using every bit of his equipment in a most unique manner. No one has created the same excitement in me since I saw Hendrix at the original Electric Factory in Philadelphia in 1968. This book is great - I'm fully enjoying it. I am sending you props on your new book – it’s great! I love your fresh take on the story of Jimi Hendrix, and also really like your heavy emphasis on the albums. After all, it’s all about the music! Your book is a spectacular work of extraordinarily high quality. Your knowledge, heart, and soul come through. Your attention is obviously dedicated to the truly relevant details that I, a deep connoisseur, most want to know. Things I've spent a lifetime discovering, like specific cuts, takes & mixes… Your book uniquely details these sources for readers. It’s a genuine service for music lovers and posterity. The visual beauty and production of your book is extraordinary. I’ve been listening and reading about Jimi Hendrix for most of my life and I learned a ton on every page of Frank Moriarty’s incisive, fascinating book. He combines a perfect mix of curiosity, insight, passion and knowledge. It seems we’ve had Jimi Hendrix’s life and music detailed and dissected in just about every way possible. Then, here comes another method. And for those people interested in Jimi’s music, this is probably the most idyllic representation of his career. So many times, Hendrix historians fall into the quagmire of minutiae of Jimi’s day-to-day life from birth to death with all the trials and tribulations in between. There have been volumes on just his concerts, others on just his recording sessions, and some just espousing theories on how he died. There are autobiographies from band mates and girlfriends. And dissections of the instruments he played. But what really matters is his music. And that’s what author Moriarty addresses with this Modern Listener Guide. He examines Hendrix in the most important way possible – looking at the music he left us with. What Moriarty does here is present a Hendrix biography based on the commercial releases that are available to the general public. No bootlegs, tape trader material, and generally ignoring compilations. What he does do is place the releases in the chronological order of the material included, as opposed to when the record (or CD) was released. This way, he can weave the Hendrix biography and explore the relationship of the recordings in their specific timeframes and examine the importance of the music within that particular chapter of life. As he states in the introduction, “This book is a guide to building and appreciating a representative body of Jimi’s work…a guide to recordings that should play a significant role in a well-rounded collection of Jimi’s essential cornerstones,” with details on, “what musical treasures you’ll find on them, and why they are important in the context of Jimi’s career.” Moriarty doesn’t hold back on any of his commentary and observations, shooting straight from the hip. With each release, he goes into a comprehensive track-by-track overview, review and analysis. A guitar player himself, he offers a musical understanding of the tracks. Plus he offers insight into the importance of the track in the time frame of the recording. Modern Listener Guide: Jimi Hendrix shows us the wealth of Hendrix material that was recorded, and what has been made available for us to hear. And now, you can make a more educated decision on that library of recorded material. Frank Moriarty has essentially written an anthology of Jimi Hendrix’s music, a really great book of chronological events and Jimi’s music. You will learn history and get ideas about what to buy, making it very educational for those just starting to collect Jimi’s music releases – but there were facts even I didn’t know. It also has a number of awesome photos I’d never seen before. In every way it’s a nice addition to everyone’s collection. In his introduction to this well-written and well-informed book, Frank Moriarty describes it as “a guide to building and appreciating a representative body of Jimi’s work…” One of the virtues of the book is Moriarty’s tendency to give greater attention to more important music: better concerts, better songs, and better albums, in some cases things listeners may have overlooked or undervalued… Moriarty offers interesting tidbits of musical and contextual information throughout the book… Moriarty’s critical judgements are pointed and insightful… Nicely designed, the volume includes scores of interesting and appropriate photographs, facsimiles, and reproductions, many likely to be unfamiliar to most readers, and all in color (except, of course, for photographs originally printed in black-and-white). There are many fine photographs of Hendrix in concert (and very few poor ones), along with reproductions of publicity materials for concerts, films, tickets, and albums… The book includes a great deal of text, clearly and vividly written… This attractively designed volume is a fine introduction to Hendrix’s music for anyone who may be new to it, and provides plenty of food for thought for those familiar with Hendrix’s catalog.